Jhulasan village, in the district of Mehsana in the state of Gujarat first caught world attention for its connection with American astronaut Sunita William’s paternal ancestors. In Jhulasan at least one person from every household either lives in Canada or US. Though the population of Jhulasan is only 5000 a recent headcount of people from Jhulasan living in United States exceeded 2000. Situated only 40km away from the city of Ahmedabad, Jhulasan stays clear from the communal violences that make Ahmadabad infamous. 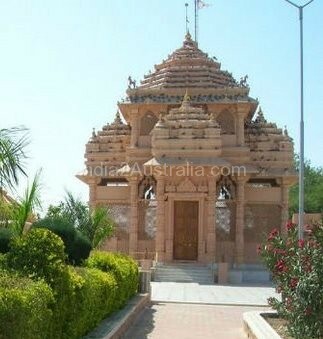 This village is also famous for its temples. Among those many temples, one temple makes this village even more special because of its deity. Dola Mata temple attracts devotees from all faiths especially those wish to go abroad and has a Muslim woman as deity. Devotees believe that Dola Mata removes all obstacles that prevent one from going abroad in search of better pastures. People take a pledge to hold a garba in the honour of Dola Mata once they reach abroad safely. The best example for Dola Mata’s spiritual power is Jhulasan itself. The devotees flock to the temple to pray Dola Mata and offer handmade horses irrespective of their cast and creed. People of all faiths live in this village in perfect harmony. Dola Mata was born in a Muslim family around 300 years ago. Dola Mata saved the village from infiltrators and looters fighting with them valiantly. Though she died fighting the enemies, her body metamorphosed into a flower and the villager built a temple on that spot. In later years the temple was rebuilt and today, there stands a beautiful temple which befits a goddess that saved the village. No one knows the real name of the Muslim woman who saved the village in whose memory the temple was built. The temple does not have any idol or picture of Dola Mata. A yantra is placed upon a stone and is covered with a saree. When there is any calamity, villagers chant ‘Dola Mata taara ghoda dodaye’ urging the mother to fight for them. Villagers believe that the deity will always protect them from all adversities.